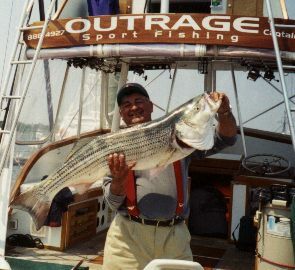 Join the OUTRAGE and experience the thrill of landing one of the most prestigious game fish of our time--the Striped Bass. Maybe you prefer the scrappy, hard-fighting, tail-walking acrobatics of Mr. Meanmouth--the Bluefish. Whatever is your game, join the Outrage and experience simple relaxation mingled with good clean outrageous fun on a roomy, comfortable 31-ft JC Sportfishing Boat.